El Matador urban trousers, a rare find on Differio. This unique style of pant is inspired by the taleguilla, the pants worn by Spanish bullfighters in the ring. Redefined by the world's famous designers, the likes of Oscar De La Renta, Georgio Armani, Moschino and more. These El Matador urban trousers feature a masculine ornate fabric, black cross buttons hardware, giving it a retro quality that has been a feature of the Milan shows. El Matador urban trousers, extremely high-wasted , with detailing down the side of the legs mirroring the embroidery on the original taleguilla. Whether you have a classy dinner or a special event, make a bold statement with the fresh take on Spanish cut design. 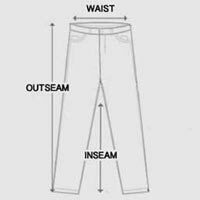 Model is wearing size S. For accurate measurements, check the table below.